Michael Leachman — the headline speaker at next Tuesday’s NC Policy Watch Crucial Conversation (click here to learn more and RSVP) that will preview the legislature’s upcoming budget session, has a post today on the Center on Budget and Policy Priorities blog, Off the Charts. North Carolina teachers plan to hold a “March for Students and Rally for Respect” on May 16 – the first day of the new legislative session — to protest low pay and inadequate school funding. As in Oklahoma and Arizona, excessive tax cuts have made it harder for North Carolina policymakers to devote adequate resources to K-12 public education. Across-the-board cuts to personal income tax rates that disproportionately benefit the wealthy by replacing the state’s graduated system (with rates of 6, 7, and 7.75 percent) with a flat rate, currently 5.499 percent. An end to the state’s estate tax, which will only benefit heirs of estates worth over $5.25 million — under 1 percent of estates. 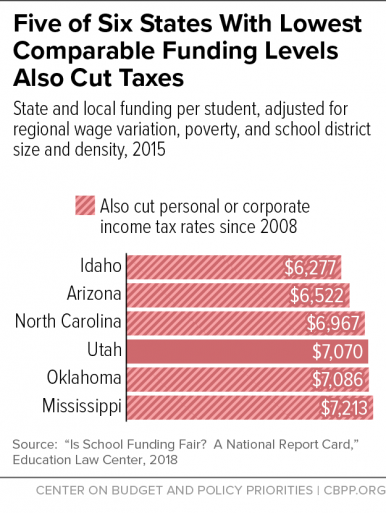 The revenue lost to tax cuts also made it much harder for the state to fund schools adequately. Only two states do a worse job in this area than North Carolina, according to an analysis by Education Law Center and Rutgers University that adjusted for student poverty, regional wage variations, and other factors that affect costs in different areas. Further, while most states have gradually restored the school funding they cut when the Great Recession hit in the 2007-2008 school year, North Carolina hasn’t come close. State “formula” funding for schools — the major form of state funding for public K-12 schools in North Carolina — is down 7.9 percent per student since the Great Recession hit, after adjusting for inflation. Large state funding cuts have made improving teacher pay particularly challenging, since salaries and other compensation for teachers and other education workers comprise most K-12 education spending in North Carolina. Average teacher pay in North Carolina has fallen 5 percent since 2010, after adjusting for inflation. While average teacher pay has shrunk in inflation-adjusted terms in most other states in recent years, the drop in North Carolina came on top of harsh, earlier cuts. Since 2000, average teacher pay in the state has fallen 12 percent, after adjusting for inflation, the third deepest cut in the nation. As lawmakers gather in Raleigh next week and hear from teachers around the state, they should focus on reversing the 2013 tax cuts — or, at the very least, put the brakes on further scheduled cuts. As the North Carolina Budget & Tax Center notes, North Carolina will lose another $900 million or so a year in revenue from the cuts scheduled to take effect next January, which would see the corporate income tax rate fall to 2.5 percent and the personal income tax rate fall to 5.25 percent. These additional tax cuts would help put the state’s budget out of balance in future years, requiring budget cuts to K-12 education and other public services – exactly the opposite of what North Carolina needs to promote a brighter economic future.